Hawaiian growers produce millions of plumeria flowers annually, and most of them become colorful leis. If you’ve donned such a lei, you may have assumed the sweet-smelling plumeria is native to the Hawaiian Islands. But you’d be wrong. Although plumeria flowers have become closely associated with Hawaii’s traditional floral necklaces since the 1800s, they hail from tropical regions of the Americas—from Mexico to northern South America and islands of the Caribbean. In their native habitat, plumerias flourish in dry scrub forests, but they have found their way to warm climates around the world—especially southern and southeastern Asia—where they grow as garden ornamentals. 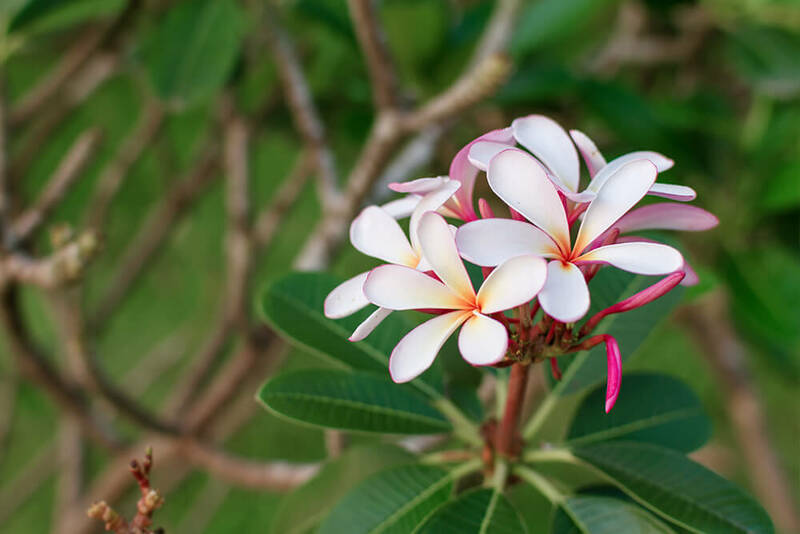 Also known as frangipani, plumerias are popular in landscaping because of the seemingly endless variety of the color, size, and fragrance of their blossoms. The plumeria’s intoxicating perfume is strongest at night, when its pollinators—moths—emerge. But when a moth investigates a fragrant blossom, it goes away hungry. A plumeria’s scent comes not from floral nectar, but from tiny structures below the flower bud. Still, a moth often probes far enough to pollinate the flower. Plumerias are large shrubs or small trees. The largest can reach a height and spread of about 20 feet (6 meters). 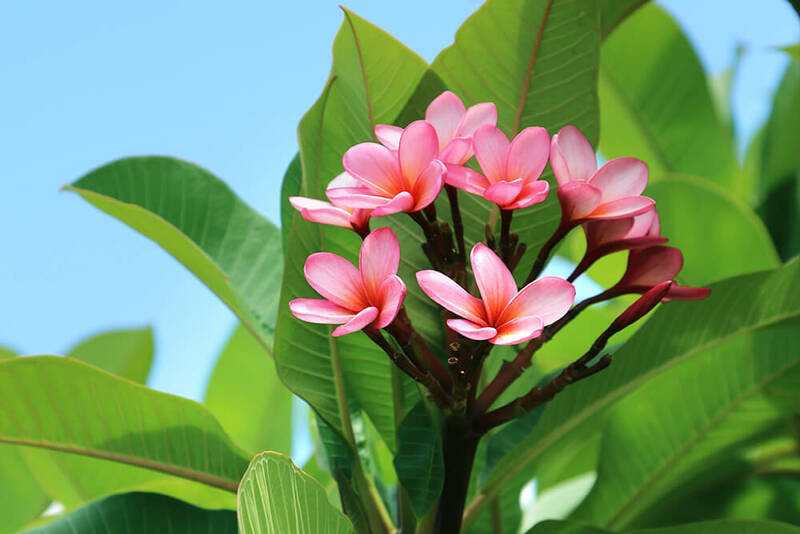 Rounded or spreading, a plumeria’s widely spaced branches bear leaves and flowers at the tips. Although some varieties of P. obtusa are evergreen, most plumerias undergo a dormant period, when flowering stops and the leaves fall. A plumeria’s deep-green, long, leathery leaves grow in dense clumps at the tips of its branches. From early summer through fall, clusters of five-petaled flowers bloom amid the leaves. Large and aromatic, flowers can be white, cream, yellow, pink, lilac, or red. Like their relatives in the dogbane family, plumerias exude a toxic, thick, milky latex from a cut flower, leaf, or stem. While the substance is so bitter that accidental poisoning is unlikely, it can irritate sensitive skin. If your location is warm enough, plumerias will spread their heavenly scent through your garden. They grow best in hot, dry locations, in full sun. In some places, they will grow in pots that can be taken indoors during winter. You can purchase a potted plumeria. Or, start your own from a cutting; let it callus over for a week or so before you place it upright in potting soil. The original "frangipani" was a perfume developed in Italy, to sweeten the smell of leather gloves. The aroma was rather musky—not floral—and it was formulated centuries before plumerias were discovered by Europeans. 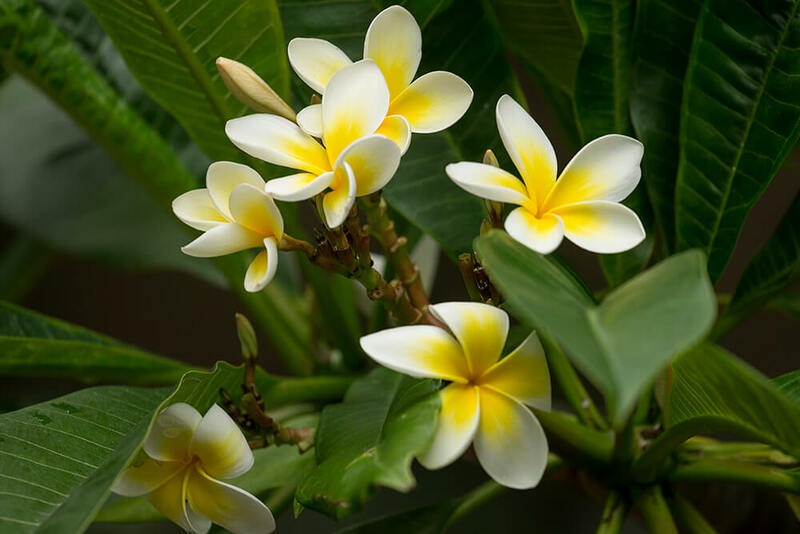 The name was later applied to plumeria flowers, and today a “frangipani” fragrance typically refers to the scent of plumeria blooms. In Asia, plumeria flowers adorn Buddhist and Hindu temples. The trees are known as “temple trees." In Malaysia and Indonesia, plumerias have come to be associated with death, because they are often planted in Muslim cemeteries. P. alba is the national flower of Nicaragua, where it is a native plant known as sacuanjoche. While it’s not native to Asia, P. rubra is the national flower of Laos, where it is called dok champa. Carl Linnaeus named the genus Plumeria to honor the 17th century French royal botanist and monk Charles Plumier. Plumeria is a member of the dogbane family, Apocynaceae, which also includes the oleander and the periwinkles.